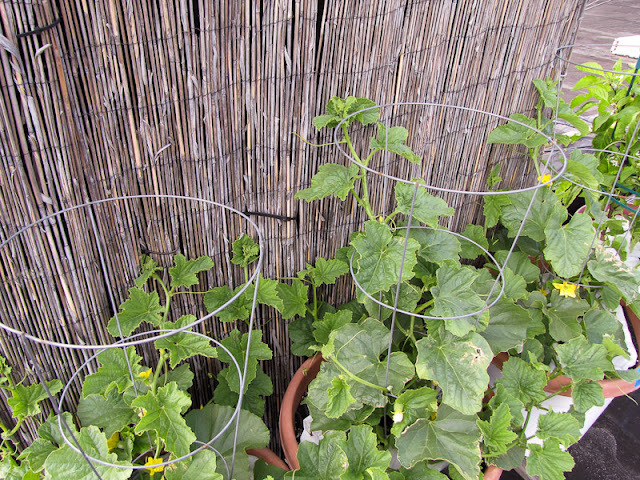 The rest of the Hakucho Hybrid melon plants have started to climb the reed fence. I'm going to wait until the plants get a little larger before I start hand pollinating the flowers. 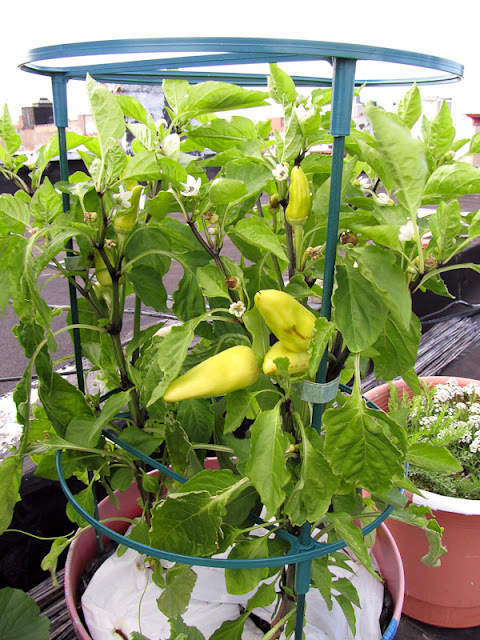 Hand pollination can be a tedious, but it's worth the effort. Last year I was able to get 7 melons out of 2 plants with hand pollination. 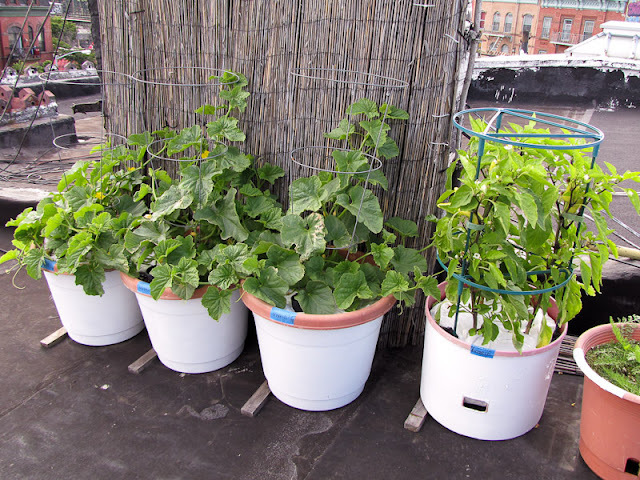 The year before that I did not hand pollinate and only got 3 melons out of 2 plants. These Flexum Hybrid peppers plants are growing like crazy, lots of fruits and flowers. Last time I checked I counted over 20 fruits. 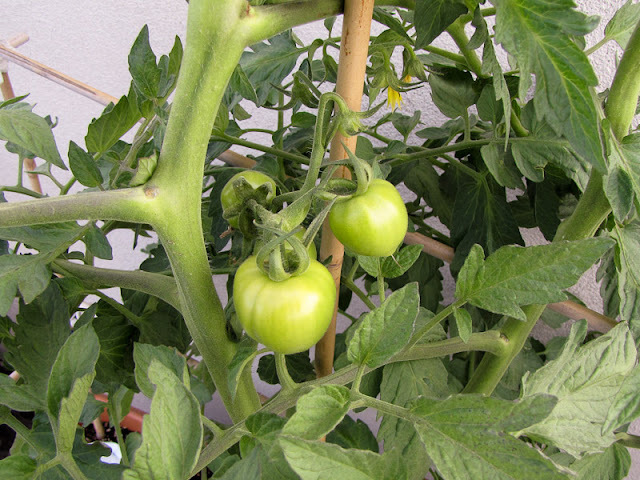 I've been spraying all the pepper and tomato plants with Epsom salt as described here: Fertilize with Epsom Salts. I don't have a control group so I can't say for certain the Epsom salt spray is making a difference, but it certainly doesn't hurt. 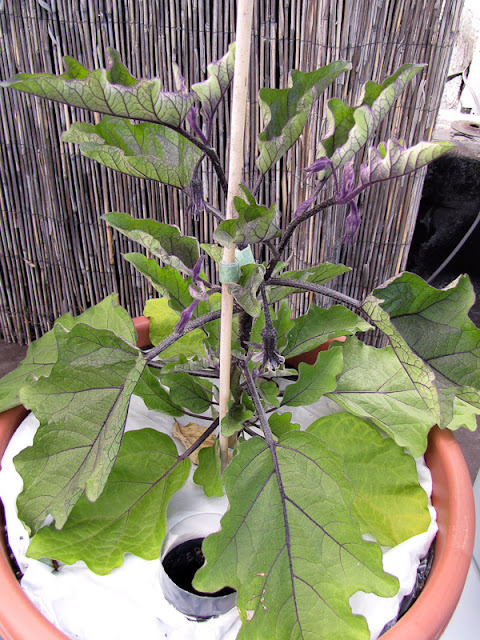 More flowers on the Pingtung Long eggplant, but still no fruit. Some red aphids have made their home on the Summertime Green tomato plants behind the shade cloth. After I took this photo both plants got a cleansing shower. If you've never had an aphid problem before you might be wondering what the white, lint like bugs near aphid colonies are. 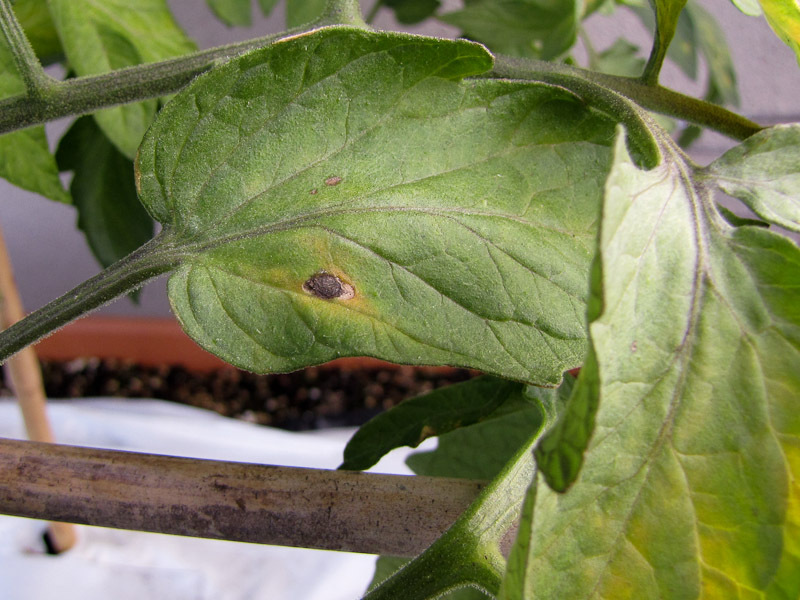 They are not another pest infestation you need to worry about, they're just the cast off skin aphids leave behind when they moult. I'm surprised by how large the flower clusters are on the Mountain Magic plant. 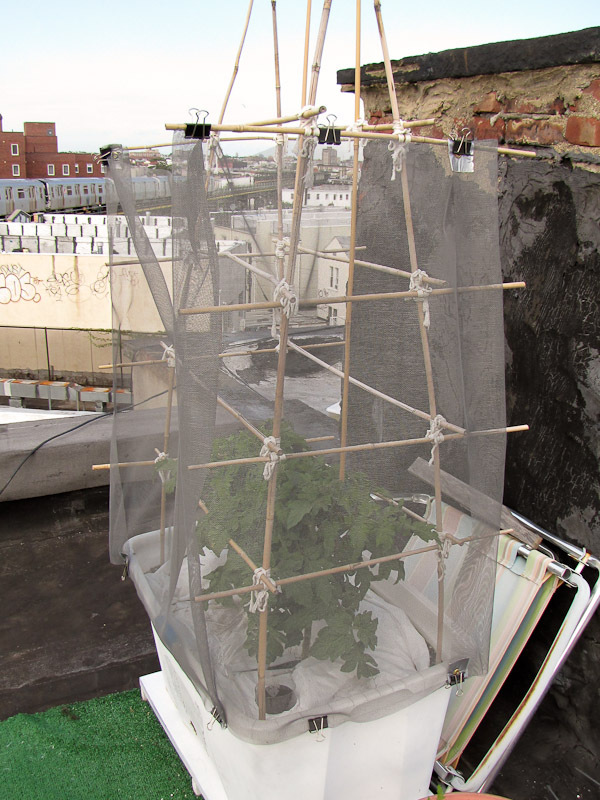 Each cluster has 10 flowers, almost as much as a cherry tomato plant. Some of the bottom leaves on the Mountain Magic plant have yellowed. 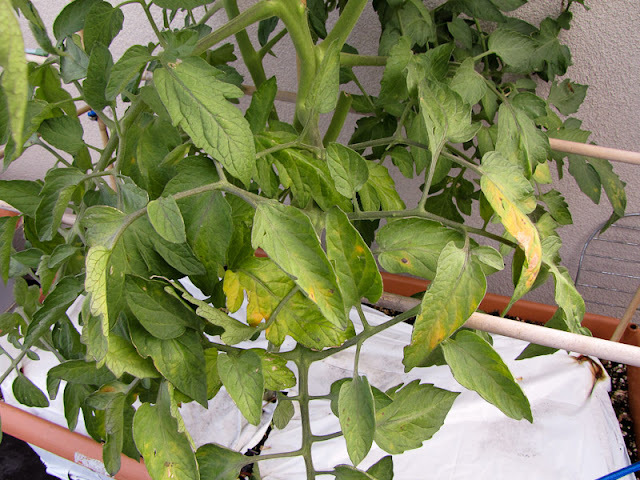 While yellow bottom leaves on a plant can mean a lot of things (mineral/nutrient deficiency or natural aging) in this case I suspect the cause is disease. Closer inspection also reveals browns spots inside the yellow areas. If it was just yellow leaves it would be harder to determine a cause, but brown spots inside yellow areas are definitely a sign of disease. In this case I'm thinking early blight. My hopes for a disease free growing season have been officially dashed, but I'm not ready to break out the organic fungicide just yet. Mountain Magic is a highly disease resistant variety so I'm just going to remove the affected leaves and watch the plant like a hawk. If it looks like the disease is spreading then I'll use the organic fungicide. Looks fantastic. Your melons are waaaay ahead of mine. I'm nervous mine are not getting enough sun. 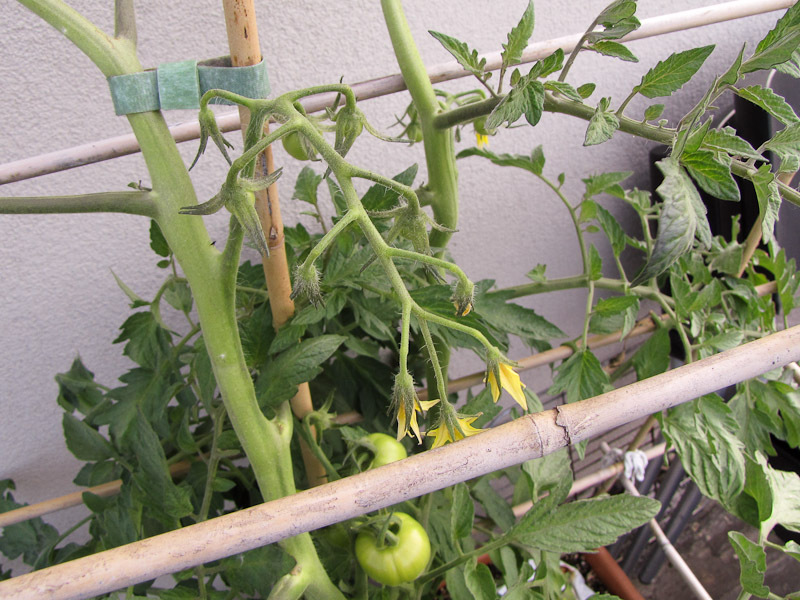 I also had yellowing leaves on one of my tomatoes. The folks at the Chelsea Garden Center suspected it was spider mites, and said to remove the yellow leaves and spray with the garlic spritz at dusk. So far so good. 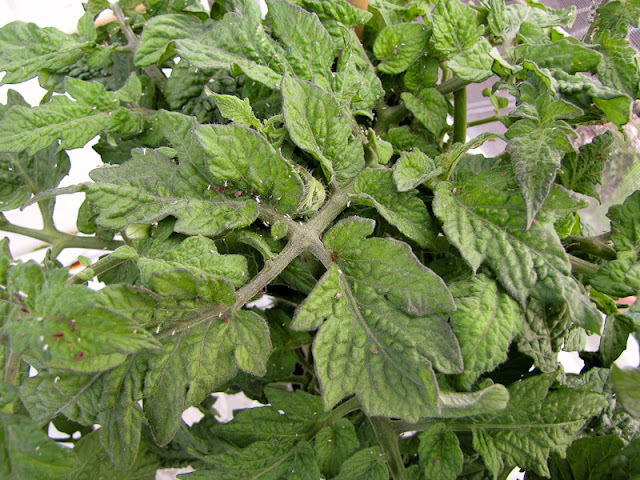 Yuck, spider mites are gross. I hate that weird dusty residue they leave behind. Glad you found a remedy. 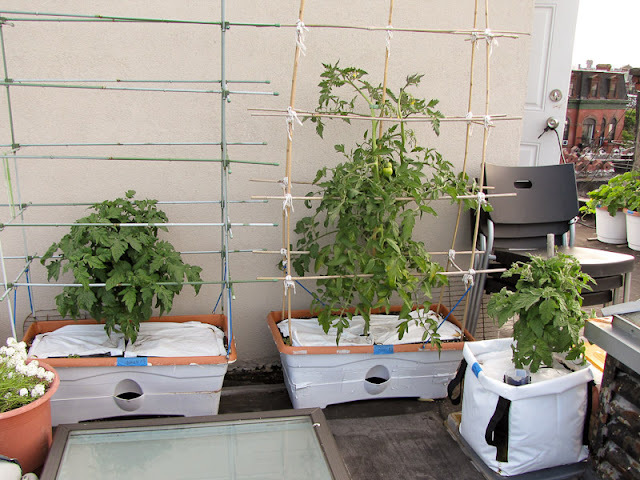 How are your plants holding up in the heat? Although the pests might be starting the garden does still look amazing. 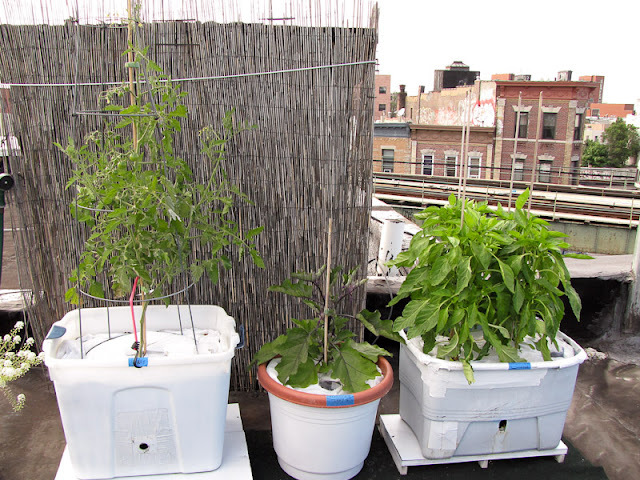 I love seeing all of the various ways you have found to conserve moisture, improve yields, resist disease and protect your plants from the harsh conditions up on the roof. I hope the pests are just passing by on their way to another garden. Thanks Kim! Even if the pests do leave others will get blown in to take their place, I think I'll ramp up the flower growing next year to compensate. Love your blog by the way.